To make sure that everything we do benefits the students at the University of Sheffield. As the Students' Union is a registered charity with set aims and objectives, we are required to ensure that everything we do benefits the students at the University of Sheffield. 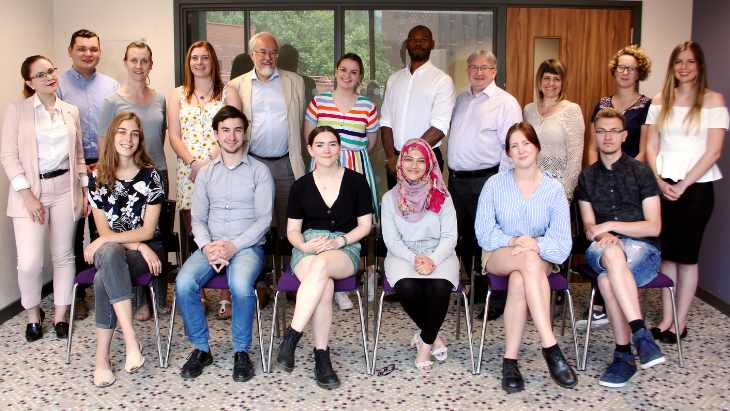 As well as monitoring what the Students' Union is doing now, the Trustee Board approves our strategic plan, ensuring that we will continue to benefit future generations of Sheffield students. To ensure that the Students' Union remains financially solvent. If the Students' Union is to carry on benefiting students, it must have the money both in the short and long term to do this. For example, the Trustees have to approve all significant items of expenditure and the annual budget. To ensure that the Students' Union doesn't break any laws or regulations relating to the work that we carry out. As the Students' Union offers so many services to our members, there are many laws and regulations that we have to follow. If the Students' Union were found to have broken any of these, it is the Trustees who would be ultimately responsible and could potentially face legal action. For example, as we have around 900 members of staff, the Trustees must ensure that we follow all the legal requirements relating to employment. All decisions by the Trustee Board are taken by all the Trustees, acting collectively and as a team. All Trustees have an equal responsibility for the oversight of the Students' Union. The Trustees of Sheffield Students' Union fall under three categories. Each of the Trustees has their own experiences which, collectively, help ensure that the Board of Trustees can carry out its roles. All trustees serve for a fixed term of office which can be renewed for a specific maximum period (depending on which type of trustee they are). Every year, eight students are elected to work one year full-time for the Students' Union as a Students' Union Officer. As the leaders of the Students' Union, they are members of the Board of Trustees, helping to ensure that we remain student focused in everything we do. Find out more about the Students' Union Officers here. Three University of Sheffield students are appointed by Students’ Union Council to serve up to two years as a student Trustee, with the nominations being approved by Students' Union Council. A further two student Trustees are elected by the student membership for a one-year term of office. The student Trustees help provide the perspective of students not involved with the day-to-day running of the Students' Union. Students' Union Council also appoints up to 4 people who aren't current University of Sheffield students to act as Trustees. They are appointed to bring professional skills and experiences to the Trustee Board, which helps it carry out its duties. They are appointed initially for a four year term of office and may be reappointed for a further four year term. Helen Mackenzie - from 1 November 2014 for four years​, extended for a further period to March 2022. Helen was General Secretary (the forerunner to the current role of President) of the Students’ Union in 1989-90, when she was Helen Pitts. As a student, Helen was involved with Nightline and was a Rights and Advice volunteer. Helen subsequently trained and qualified as an accountant and has worked in a number of roles for several local authorities. She is currently Head of Exchequer Services for Comhairle nan Eilean Siar (Western Isles Council). She has also worked as a Management Consultant and a Non-Executive Director of NHS Western Isles. Until recently she was Chair of a School Parent Council and has also chaired Disability Lewis (an advocacy organisation for disabled people). Mark was Treasurer of the Students’ Union (a Sabbatical Officer role) in 1983-84 and was also a member of Union Council for four years. Mark has worked for a number of years in the insurance and risk management sector, as an insurance broker, insurance services manager and Vice President Risk Finance. Professor Paul White OBE served as the Deputy Vice-Chancellor of the University of Sheffield from 2014-2015; acting Vice-Chancellor between 2013 and 2014 and Pro-Vice-Chancellor for Learning and Teaching from 2004-2013. Paul brings a wealth of knowledge and experience of higher education having fulfilled significant strategic roles at local, regional and national levels in the development of widening participation, quality enhancement, international student education and the student voice in educational developments. He is also a Deputy-Lieutenant for South Yorkshire, and Vice-Chair of a local school academy chain in a less affluent part of Sheffield. Dan is highly experienced and knowledgeable about young people’s transition to adulthood and is a strong advocate of diversity and inclusion. He is currently the Head of Health and Targeted Services in Sheffield for young people, young adults and communities. Dan is also a qualified Youth and Community Worker, with an MA in Design and a post graduate qualification in management. How can you influence the trustees? Whilst the Trustees have to take a number of decisions that may not seem directly relevant to your student experience, it is vital that they are accountable to the members of the Students' Union. The Students' Union Officers are your elected representatives but they all act as trustees. Whilst they are obliged to think about the overall organisation when taking decisions as trustees, they still take into account the wishes of the student population. If you are concerned about a decision the trustees are considering, or believe there is a matter they should be considering, please email sucouncil@sheffield.ac.uk and your question will be directed to the appropriate officer.